Scott Massey was introduced to science, technology, engineering, and math (STEM) at a young age. Like many kids, he often played with Legos, building planes and ships while developing an early interest in mechanical engineering. Through his relationship with his grandfather, Massey was exposed to being creative with STEM. Massey continued to pursue his love of STEM at Purdue University, where he studied mechanical engineering technology. He then explored entrepreneurship as a viable career path and enrolled in the Entrepreneurship and Innovation Certificate Program. It wasn’t until he discovered his passion for hydroponics that he had the idea to start his own venture. Massey and Ivan Ball co-founded Heliponix their senior year at Purdue and built the GroPod to solve the global food crisis. The Industrial Roundtable at Purdue University is one of the largest career fairs in the country, with more than 400 recruiters last year and attracting around 12,000 students. Though these career fairs offer diverse employment opportunities, Massey didn’t find careers where he was able to prototype his own technological theories with hydroponics. Massey started filing for patents for the GroPod his senior year. He and the Heliponix (formerly Hydro Grow LLC) team created their first prototype and built a company around the technology. Though the path of entrepreneurship hasn’t necessarily been easy, Massey said it is rewarding to be able to follow his passion for solving a real, global problem. This summer, the ag-tech startup company turns two. Through his journey with his STEM business, Massey said he understands the value of educating the next generation. 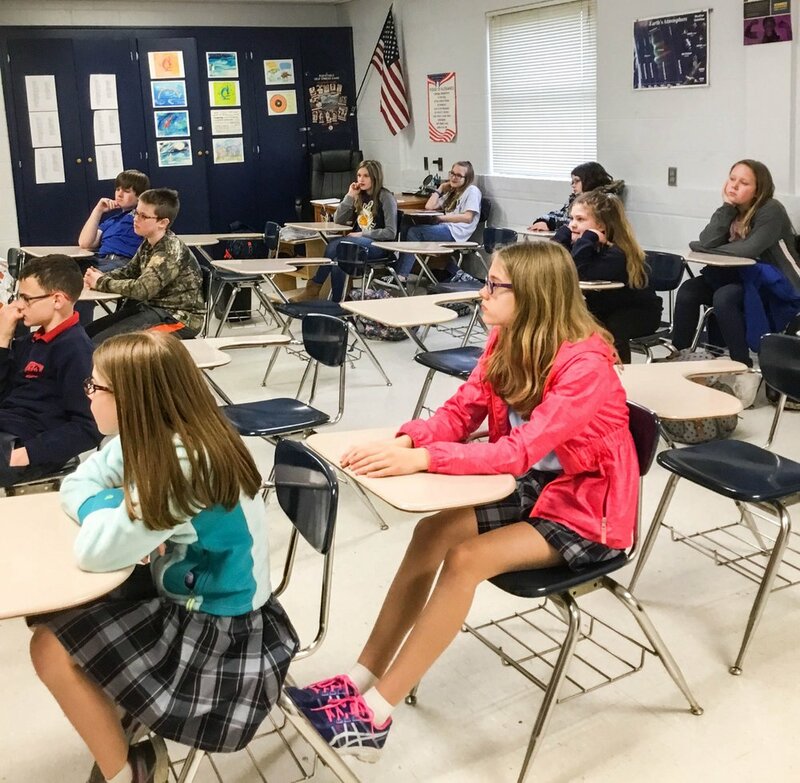 Laura Swessel, a physics and earth/space teacher at Our Lady of Providence Junior/Senior High School in Clarksville, Indiana, organizes the STEM clubs at the school. Swessel said that since she started her 20-year career as a mechanical systems engineer, she believes it is important to expose young children to all aspects of STEM, including careers. Massey held a STEM demonstration for the fourth through sixth grade STEM Club students about indoor agriculture technology. Massey also discussed the tech behind the Heliponix GroPod and the importance of the self-sustaining unit capable of growing fresh produce in a consumer’s home. Indiana as a state has become increasingly invested in STEM education as well as supporting entrepreneurs, like Massey. In 2012, the Indiana Department of Education began a statewide STEM education plan, identifying the need for ‘rigorous and engaging’ STEM education in schools. The plan includes resources, funding, and information so local schools may better implement STEM education into curriculum and provide options to become further involved in STEM focused, extracurricular activities. The STEM Teacher Recruitment Fund, a $10 million grant program, has also been initiated to grow the number of STEM teachers in classrooms across the state. Applications for the 2018 Governor’s STEM Team are open, honoring four high school students for their exemplary performance in a STEM subject, where winning students receive a $1,000 college scholarship. Indiana has also recognized the importance of supporting entrepreneurship and the important role it plays in economic development. The Indiana Economic Development Corporation organizes several programs and consolidates resources that support businesses and entrepreneurs, such as Elevate Ventures, the Indiana Small Business Development Center, as well as the state’s network of more than 150 coworking spaces, incubators, accelerators, and maker spaces. Across the state are seven different coworking ecosystems through Purdue Research Foundation’s park locations. The state also supports the Battery Innovation Center, a WestGate@Crane Technology Park tenant, which leverages Indiana’s public and private-sector assets in advanced technologies, Elevate Ventures Kinetic Conference which showcases Indiana’s high growth business, as well as the Next Level Fund which supports innovation in Indiana by making strategic investments in high-growth, high-potential companies. Entrepreneurship education has been a focus at the university level, such as the Burton D. Morgan Business Model Competition at Purdue University and the Clapp IDEA Competition at Indiana University Kelley School of Business. Together, these competitions alone award more than $50,000 each year to student entrepreneurs. This year, the first statewide student pitch competition for high school students, the Innovate WithIN 2018 Pitch Competition, awarded prizes totaling $100,000 and will expand in 2019. The inaugural competition drew 86 applicants from nearly 300 students at 65 high schools. As a young entrepreneur, Massey believes in the value of STEM entrepreneurial education. Thank you to the resources and staff at the Indiana State Library, the Office of Governor Eric J. Holcomb, and the Indiana Economic Development Corporation for their help in researching information for this article. A special thank you to Laura Swessel and the students at Our Lady of Providence Jr./Sr. High School for allowing us to share their entrepreneurial education story. Purdue@WestGate offers tools for startups, entrepreneurial experts, programs, educational opportunities and workforce development to help southern Indiana businesses grow and thrive.